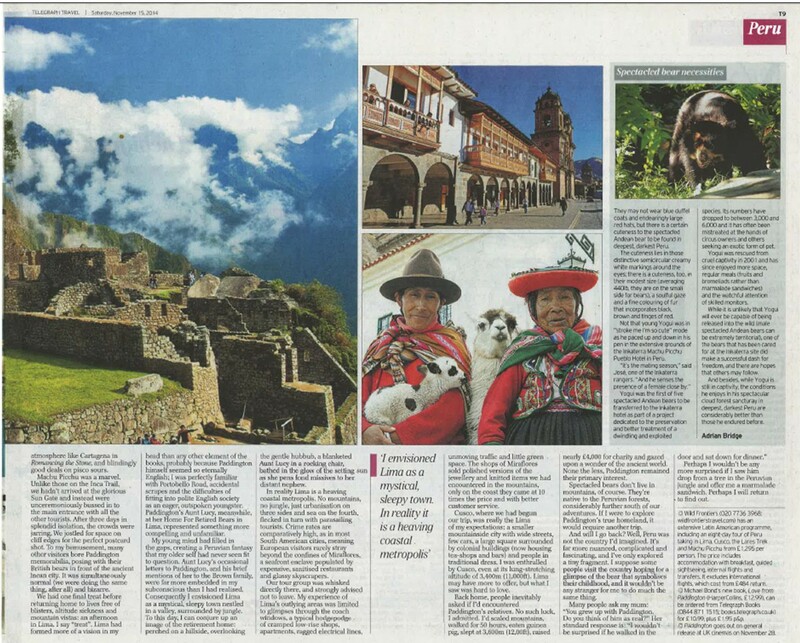 The other week, to accompany the new Paddington film, I wrote an article for the travel section of the Telegraph about my trip to Peru four years ago. It was a two-page spread, 1,500 words, and written by me. Me! 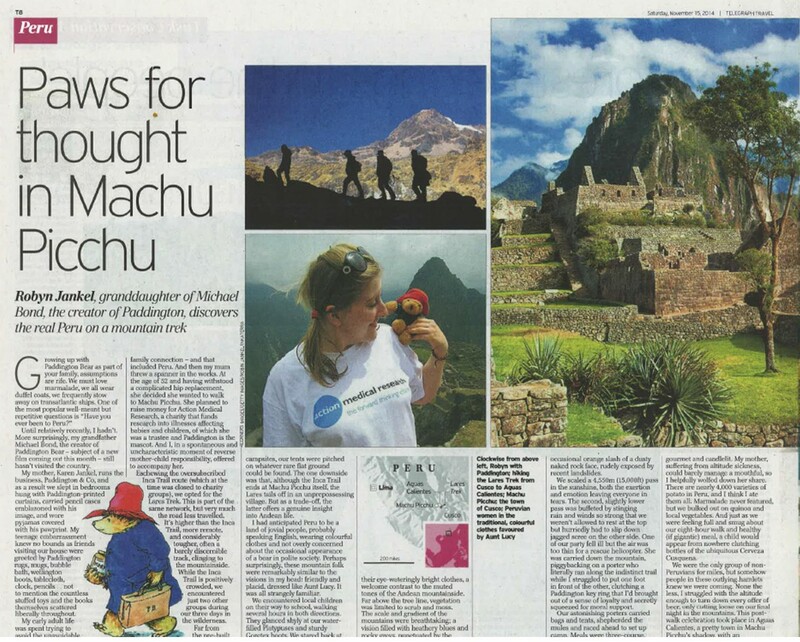 I’m not imagining it, there’s my name and there’s my photo in front of Machu Picchu: it’s all there in black and white (well, colour actually). As an aspiring travel journalist, it’s probably the highlight of my life. Certainly my 20s. Maybe 2014. Let’s not peak too early. To uncharacteristically cut straight to the point: my grandfather is Michael Bond, creator of Paddington Bear, author of worldwide-selling books, British icon, not international man of mystery nor 007 but hell, close enough. At the risk of sounding ungrateful and unappreciative, when one is related to someone of this talent, creator of something this famous, there are downsides. It’s rare to be described simply as “Robyn Jankel”. I’m inevitably “Robyn Jankel, granddaughter of Michael Bond, the creator of Paddington Bear”. And it’s tough because as an aspiring writer, I want to be seen on my own merits. I love my grandfather and can’t quite grasp his impact on the world, on the childhoods of unknown millions – that from his head, and his alone, sprung something unintentionally huge and undeniably wonderful – but it can be tricky to live in that shadow. Sometimes I just want to be “Robyn Jankel, wearer of sparkly shoes, blogger of feminist rants, baker of unsuccessful cakes”. I’m terrified I’ll be accused of riding on his coattails or using his fame to propel my fledgling career. Basically I’m proud and extremely stubborn, and pissed off that my natural talents didn’t lie in something helpfully different, like animal husbandry or interior design. So why talk about it today? Two reasons, really. One, the film has come out and those acquaintances who weren’t previously aware of the connection will certainly know it now. (One part a: Google is a powerful tool). Two, I’m proud of my own work, and I want to share it on my blog. I’m excited to have been published in a national newspaper. And one sentence in, my cover’s been blown. So I might as well embrace it, and take the opportunity to explain my previous reluctance. So there it is: my grandfather is a famous author. I got published in a national newspaper because I’m his granddaughter. But also, I hope, because they liked what I wrote. And fingers crossed, next time my name will be in the byline for something entirely unrelated to Paddington, and I’ll be Robyn Jankel: traveller to exotic locales, embracer of the unexplored, seeker of adventure, writer of words. That would be lovely. And it would make my grandfather very proud.